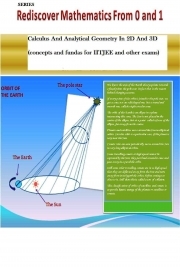 Description of "Calculus And Analytical Geometry In 2D And 3D Part II Differential Calculus, Conic Sections And Theory Of Equations (eBook)"
This part of the whole book comprises the chapters on limit, continuity, differentiation and its applications, conic sections, meanings of eccentricity, showing how they are really sections of cone,circle, properties of triangles, ellipse, parabola, ellipse and hyperbola, tangents and normals in general with particular reference to conic sections, poles, polars, diameters, central conics, asymptotes and envelopes, intersection of conics etc. in the curriculum of CBSE, ICSE and other state councils for +2 level and equivalent courses abroad. This is also fundamental requirement for IITJEE and other entrance exams. The celebrated coaching institutes expect this fundamentals from the students they admit into their institutions. A first class M.Sc. in Mathematics from Utkal University, in 1981 with 5th position. Close assodciations with Orissa Mathematical Society ( life member) and The American Mathematical Society. The author is aware of present day needs of the student regarding what are the topics ( and what may be required in future) and regarding their personal needs regarding how the topics should be taught. Reviews of "Calculus And Analytical Geometry In 2D And 3D Part II Differential Calculus, Conic Sections And Theory Of Equations (eBook)"